Daily new Latest Government jobs updates. Age limit: A Candidate applying for English Stenographer Grade-I or Gujarati Stenographer Grade-I, shall not be less than 21 years and not more than 40 years of age and for English Stenographer Grade-II or Gujarati Stenographer Grade-II, shall not be less than 21 years and not more than 35 years of age, as on 15/10/2016 i.e. the Last Date for submitting the Online Application. Exam Fees: Candidates belonging to Scheduled Castes, Scheduled Tribes, Socially & Educationally Backward Classes, Differently Abled Persons and Ex-Servicemen are required to pay Examination Fees of ₨250/- (plus the usual Bank Charges) and all other Candidates are required to pay Examination Fees of ₨500/- (plus the usual Bank Charges), through any of the Core Banking Service Branches of the State Bank of India, using the Special Format of 'CASH VOUCHER', as appended to this Advertisement, from 01/10/2016 to 15/10/2016, during the Bank Working Days and Hours. Gujarat High Court Recruitment 2018: The High Court of Gujarat has been published an English and Gujarati Stenographer official notification 2018 for 276 Bharti 2018. 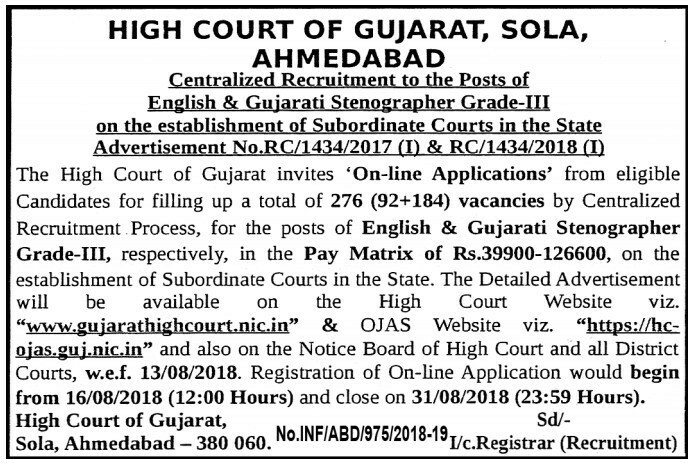 So High court of Gujarat Recruitment will be conducted for the post of Stenographer in the state of Gujarat. If you are waiting for high Court of Gujarat Jobs then you must grab this wonderful opportunity. Huge numbers of candidates are waiting for the latest government jobs at 10+2, Graduation level. Candidates will able to get Rs 34,000/- +++ per month. The online application form for Gujarat High Court stenographer Vacancy can be filled from official website “Online Job Application System (OJAS)”. 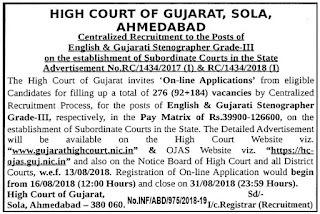 Interested, Eligible and qualified candidates can apply online for Gujarat HC stenographer jobs from 16th August 2018. We suggest all students that they must have necessary documents, certificates and a valid E-Mail ID and password at the time of registration so you can apply for stenographer Bharti 2018 easily. You must submit the Gujarat High Court Recruitment 2018 application form on or before 31st August 2018. The Gujarat high court invites the interested and eligible candidates for the post of Gujarat high court stenographer for Total 276 stenographer vacancies. Gujarat high court Jobs is very safe and prestige job due to high salary. The department will conduct the written exam for Gujarat high court stenographer. Candidates have to undergo Elimination Test, Main Written Exam, Practical/ Skill (Typing) Test. Based on candidates performance final selection is done. Candidates have to submit Gujarat High Court Application Form 2018 before last date 31st August 2018. (i) The Written Test (Objective Type) consisting of Multiple Choice Questions (MCQs), shall be administered ‘On-line’, through a ‘Computer-Based Examination System’ and shall be evaluated by real-time assessments, as per entries made by the Candidate, in Computer itself, at the end of the said Written Test and therefore, reevaluation of entries answers, subsequent to Written Test, will NOT be entertained by the High Court. (ii) Written Test will be of 40 Marks (Duration : 1 Hour), each Question of 1 Mark, without Negative Marking. (iii) Written Test will be consisting of General Knowledge, General English, Gujarati Language, Current Affairs, Numerical & Mental Ability, Computer Fundamentals / Operation etc. (iv) The Candidate securing minimum 50% Marks in Written Test, shall only be called for next stage i.e. Stenography / Skill Test.